The harvest moon behind South Shields Lighthouse. Pic: Owen Humphreys/PA. Clear skies over the North East were a photographers' delight last night as the harvest moon showed its face. The famous astrological phenomenon is the name for the full moon that is closest to the autumn equinox. Wendy Price spotted the harvest moon from Marsden Grotto. It also coincided last night with a penumbral eclipse - when the moon passes through the outer part of the earth's shadow, creating a noticeable shady corner of the full moon. Press Association photographer Owen Humphreys captured the stunning image at the top of this article, showing the harvest moon beside South Shields Lighthouse. Wendy Price took her shot while having dinner at Marsden Grotto, South Shields. 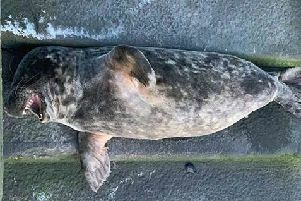 Ashley Foster's pictures were taken beside Hartlepool Marina. Ashley Foster caught the harvest moon at Hartlepool Marina. Keith Scott took his picture from the beach at Horden in County Durham. And Leanne Chalkley was also down by the beach, at Seaburn, Sunderland, to capture her atmospheric shot. Keith Scott took this picture from the beach at Horden. Leanne Chalkley took her picture at Seaburn.